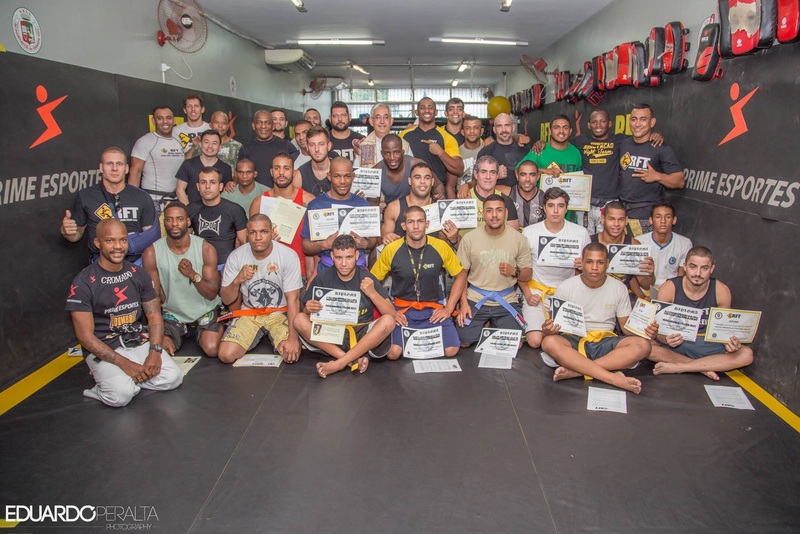 Under the direction of RFT Leader & Head Coach Marcio "Cromado", together with his black Belts Julio Moschini, Felipe Borges, Julian Fabrin, Genair Martins, Leonardo Nascimento and in the presence of the President of the “Federação Internacional de Luta-Livre Submission” Daniel D'Dane; the graduation ceremony was held on the 12nd December 2014 in the headquarters of Renovação Fight Team in Rio de Janeiro, Brazil. More than 30 athletes from the various RFT gyms received their well-deserved graduations. 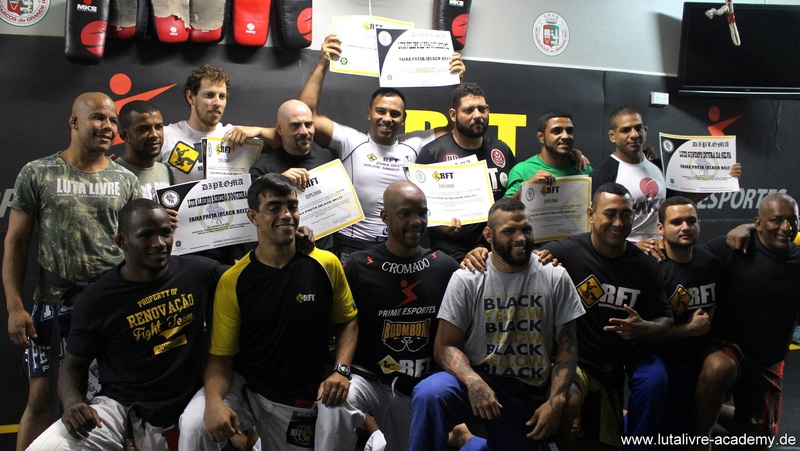 Among them, 2 brown and 8 new RFT Black Belts were awarded by Mestre Marcio "Cromado". One of the new Black Belts was national coach of RFT Deutschland, Ricardo Maciel Welko (Nico Welko). 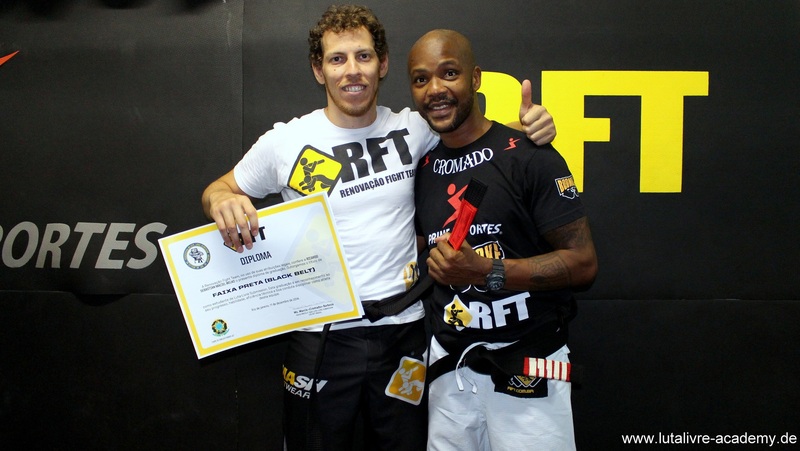 Mestre Marcio Cromado handed him the graduation with the words "[...] we award the deserved Black Belt with pride to our friend and responsible for RFT in Germany and Europe, Nico Welko [...]". 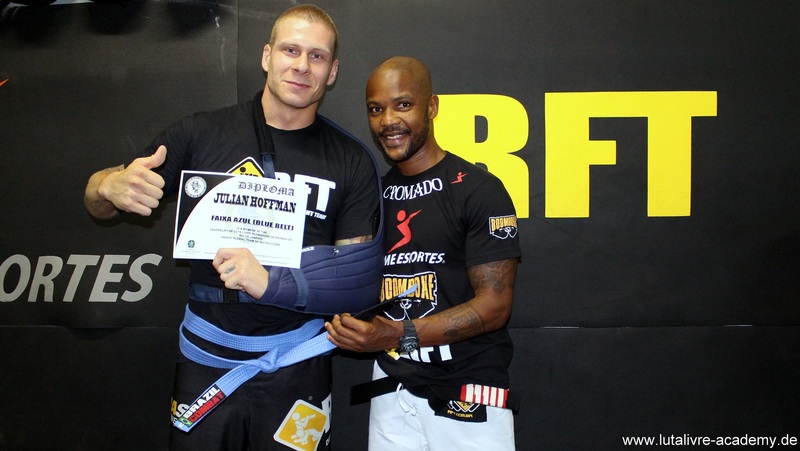 Subsequently, Nico Welko got the Black Belt tied by Julian "Jabbá" and commented "[...] I knew from the very first moment that I'm at the right place, with the right people and at the right team [...] I will wear this Black Belt with pride and great responsibility for the rest of my Luta Livre life and continue the work of Mestre "Cromado" and RFT wherever I may go [....]". Nico Welko warmly thanked his master Marcio Cromado and also expressed special thanks to Luiz "Besouro", Gustavo "Gugú", Rodrigo "Brandão," Luiz "Betão", Felipe Borges, Julian "Jabbá", Junior "PQD", Leonardo "Chocolate", Leonardo Coelho, Carlston "Moçambique" Rodrigo "Mogli", Jorge "Blade" and many others of the team who have accompanied and supported him on this path. Nico Welko with Mestre Marcio "Cromado"
Also graduating to the next belt at the ceremony was Julian "BAM BAM" Hoffmann, longest and dedicated student of Nico Welko. "BAM BAM" impressed with his skills in training sessions with the experienced Luta Livre Pro units of the RFT in Rio de Janeiro. Acknowledging this, Mestre Marcio Cromado awarded him the Blue Belt in RFT Luta-Livre and welcomed him into the RFT family. BAM-BAM with Mestre Marcio "Cromado"